Loose and inconsistent stools are an indications of diarrhoea, diarrhoea is an effective way for the body to get rid of an undesirable substance, this may be followed with symptoms like vomiting, stomach pain, thirst, fever, nausea, dehydration. But it can be dangerous especially for children and old aged people if not treated immediately. sometimes stool in diarrheoa contains blood also. Diarrhoea may be due to food poisoning, bacterial infection due to the use of contaminated food or water, food allergies, excessive use of alcohol or laxatives or spicy food or caffeine, improper and insufficient sleep, constipation, side effects of allopathic medicines. 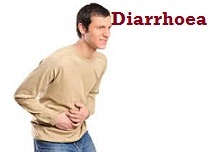 Human body uses diarrhea to flush out bacteria or viruses which might have ingested by eating contaminated food. So it might not be advisable to stop diarrhea too quickly. However, if diarrhea goes on for several days, dehydration and loss of important nutrients may occur which can be fatal especially in children. It may lead to gastritis, enteritis, gastroenteritis etc. Diarrhea can be stopped with medication, but the medicines may interfere with the natural process of cleansing, that the body desperately needs. With natural remedies we may help ourselves feel better without stopping the immune system from its work. So we can use the natural home made remedies to cure diarrheoa. 1. A glass of water can be boiled and cooled., Slight sugar and salt can be added. Drinking this water frequently helps to avoid dehydration during Diarrhoea. 2. Drinking Lemon juice 4-5 times a day helps to cure Diarrhoea. 3. Pomegranate (Anar) leaves boiled in water with Sugar and filtered. Drinking this decoction 3 times a day helps to cure Diarrhoea. 4. Drinking half cup of Mint (Pudina) juice in every two hours helps to cure Diarrhoea. 5. Wall nut (Akhroat) grinded with water and this paste applied on the naval helps to cure Diarrhoea. 6. Drinking Basil (Tulsi) juice mixed with Betel (Pan) juice helps to cure Diarrhoea. 7. Orange juice mixed with Milk taken helps to cure Diarrhoea especially for children. 8. Eating a spoon of Dhania (Coriander) powder with Black salt after meals is helpful in curing Diarrhoea. 9. Drinking hot water mixed with Ginger juice once in a hour helps to cure Diarrhoea. 10. A spoon of pure Ghee (made from cows milk or buffaloes milk) taken with hot water both morning and evening helps to cure Diarrhoea. 11. Eating a spoon of Carrom seeds (Ajwain) powder with hot water helps to reduce Diarrhoea. 12. Eating a ripe Banana with Buttermilk (Chach) is a good remedy to cure Diarrhoea. 13. Apple pieces without skin boiled in milk taken 3 times a day (but not directly Apple juice) cures Diarrhoea. 14. One gram of Neem seeds and one gram of Sugar taken with hot water and eating only boiled Rice with Curd in the meals cures Diarrhoea. 15. Eating Carrot is good for curing prolonged Diarrhoea. 16. One spoon of Ginger juice, half cup of Curd mixed with half cup of Mango juice and taken helps to cure Diarrhoea. 17. For watery Diarrhoea, taking a spoon of roasted Cumin seeds ( Jeera ) with half spoon of Honey 4 times a day is helpful. 18. For watery Diarrhoea taking roasted Cumin seeds (Jeera) and Black salt with Buttermilk after meals is helpful. 19. Boil Aniseed (Sauf) with water and filtered. This filtered water can be used to make wheat flour dough for making Rotis. eating these Rotis are beneficial during Diarrhoea. 20. Taking two teaspoon of Flea seeds (Isabgol) with Curd both in the morning and evening cures Diarrhoea. 21. 2 grams of Cinnamon (Dalchini) powder taken with warm water 3 times a day helps to cure Diarrhoea. 22. For Diarrhoea in children it is advisable to give Aniseeds (Sauf) water with a pinch of Black salt. 23. A spoon of Honey taken with half glass of Buttermilk (Chach) helps to cure Diarrhoea. 24. Mix few Flea seeds (Isabgol) with Curd. Add Salt, dry Ginger (Saunth), Cumin seeds (Jeera) powder and drinking this for few days helps to cure Diarrhoea. 25. Eating Lentil (Masoor dal) is good for people having Diarrhoea. 26. Onion paste applied on the naval helps to stop Diarrhoea. 27. Half spoon of Dry Gooseberries (Amla) powder mixed with same quantity of Black salt taken with water helps to cure Diarrhoea. 28. Eating boiled raw Papaya (Papita) is good for Diarrhoea. 29. Boil tender Guava (Amrud) leaves with water, filtered and drinking this decoction helps to cure Diarrhoea. 30. Left out water after boiling Rice (Chawal) is good for Diarrhoea. For children half cup and for adults one cup of this water can be given which cures Diarrhoea. 31. Taking Half cup of Mango juice and 25 gm Curd with a spoon of Ginger helps to cure prolonged Diarrhoea. 32. Take 3 Black berry (Jamun) leaves, neither too tender nor too ripe, grind them with Rock salt (Saindha namak) and make a tablet of it and take one tablet both morning and evening to get instant cure for Diarrhoea. 1. Taking Mango seed powder with Buttermilk is a good remedy to cure Diarrhoea. 2. Fenugreek (Menthi) seeds powder taken with Buttermilk or Curd helps to stop Diarrhoea. 3. 20 grams of Black berry (Jamun) seeds grinded with water and taken twice a day helps to stop Diarrhoea. 4. Drinking half spoon of Lemon juice with Goat milk helps to stop Diarrhoea. 5. Onion pieces or Spring onion (Onion flower) taken with fresh Curd also stops Diarrhoea. 6. Pomegranate juice (Anar) taken 3 times a day gives relief from Diarrhoea. 7. Drinking Pomegranate juice (Anar) mixed with equal quantity of Sugarcane (Ganna) juice helps to cure Diarrhoea. 8. 15 gram of Coriander powder (Dhania) and 12 grams of Sugar candy (Mishri) taken with water stops Diarrhoea. 9. Taking Ber Fruit (Zizyphus) helps to cure wounds in the intestine during Diarrhoea. 10. Sweet neem (Curry patta) leaves grinded and taken with Buttermilk or chewing Sweet neem leaves with pure Honey stops Diarrhoea. 11. Eating Dates (Khajur) everyday helps to overcome loss of nutrients during Diarrhoea. 12. Pomegranate (Anar) skin grinded and taken with Buttermilk stops Diarrhoea. 13. Making Tea with Cardamom powder (Elaichi) and drinking this tea also stops Diarrhoea. 14. Eating Banana with Sugar or eating Banana mixed with Buttermilk also cures Diarrhoea. 15. Chewing Carrom (Ajwain) seeds after every meals also stops Diarrhoea. 16. Eating Boiled Jo (Barley) also helps to stop Diarrhoea. 17. Beet root juice mixed with Honey can be taken which helps to stop Diarrhoea. 18. Mix Guava (Amrud) pulp without seeds and a spoon of Honey in Milk. Drinking this milk helps in curing Diarrhoea. 19. Eating small pieces of raw Mango or grounded raw Mango skin with Buttermilk twice a day also helps in curing Diarrhoea. 20. Taking Banana pulp and Tamarind (Imli) pulp mixed in a glass of Buttermilk for 2-3 days cures Diarrhoea. What is Ayurvedic medicine, and what are more benefits of homemade Ayurvedic medicine? Learn that and more in this Ayurvedic home remedy guides given below.